The Fakir Of Venice (2019) THE FAKIR OF VENICE is the story of an Indian fixer who has a life-changing experience. Adi Contractor (Farhan Akhtar) works in films as the production controller. His job is to ensure that the bizarre demands of the producers are met. He once manages to get a monkey from China as per the requirement of an urgent film shoot in the Himalayas near the border on the Indian side! He is based in Mumbai where his ex-girlfriend Mandira (Kamal Sidhu) and her colleague Avantika (Sushma Prakash) ask him to meet the requirement of a reputed art gallery in Venice. They are in search of a fakir or a sadhu who can be buried in the sand for hours and thus can awe the visitors. Adi takes up the offer and he sets off to Varanasi to find the fakir in question. But his search yields no results. After returning to Mumbai, he decides to meet Amin aka Goldtooth (Joginder Singh), who’s also a ‘jugaadu’ guy. Amin introduces Adi to Sattar Shaikh (Annu Kapoor), a poor and impoverished slum dweller who paints buildings for a living. Adi realizes that Sattar is apt for this job. Sattar too agrees since he realizes that he’ll be paid handsomely and he can give the money to his married sister Hamida (Jhilmil Hazrika) with whom he resides. Adi with the help of Mandira trains him to pretend to be a fakir and gives him the right clothes. Both then reach Venice and the madness begins. Visitors are awed to see Sattar being buried in the ground with just his hands protruding out. Adi meanwhile spins imaginary story about the extraordinary powers of the ‘fakir’. However, Sattar is fighting his set of demons and there’s a risk that it can expose their lies. What happens next forms the rest of the film..
All Said And Done, The Fakir Of Venice Is A Story Aimlessly Roaming On The Streets Of Venice. 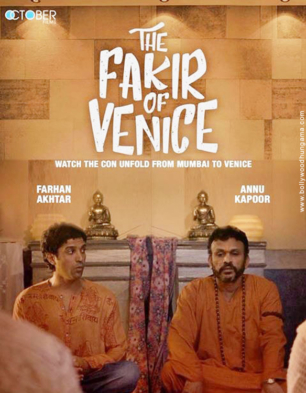 Good..
On The Whole, THE FAKIR OF VENICE Boasts Of An Interesting Plot And Bravura Performance By Annu Kapoor. But.. The Fakir Of Venice Is A Two-character Comedy At Most Parts And It’s The Interaction Of The Two Central.. The Fakir Of Venice Is Not Everyone's Cup Of Tea. If Off-beat Stories Are Your Thing Then This Con Job Makes.. While The First Half Meanders And Stretches On, It Is In The Second Half When The Film Finds Its Groove. At 1..